Foxes have been in the news a bit recently and it seems everyone has an opinion. There are those who feel animosity towards foxes after some reports in the media that they have attacked children in urban areas. I find this to be an overreaction for reasons I’ll come to later, but it also seems that those in the country support fox hunting as a way to control these so-called pests, as they steal lambs and chickens and soft city folk ‘just don’t understand our ways.’ They can be seen as a nuisance, getting into bin bags and causing a mess and ‘invading’ our space. They are represented as wily and cunning in literature and perhaps not altogether trustworthy. So, what are we to make of all this? Well, foxes are the most widely spread species of wild dog in the world and are hugely adaptable, living in just about any kind of environment you can think of. They are related to our beloved canine companions and carry some of the same traits. In fact, it takes as little as three generations of selectively breeding foxes to start the domestication process – to have them develop floppier ears and even have their tales become less fluffy. It seems though that their adaptability has made them unpopular in areas where, let’s face it, humans have taken over their territory, not the other way round. Let’s start with the country. People in rural areas are portrayed as disparaging of any compassion shown towards foxes as they are a pest that must be dealt with. This theory has several holes in it, not least as the views of country people are horribly misrepresented. In fact, 80% of those in rural areas oppose fox hunting. In a study this month, fox hunting came seventeenth in a list of eighteen ‘field sports’ just beating swimming outdoors which took the bottom spot (Swimming outdoors? In Britain? Seriously?) Anyway, as for foxes taking lambs, less than 1% of lamb losses in the UK can be attributed to foxes, with a far greater number of deaths due to cold, neglect and general lack of care by farmers. Also, the costs of foxes praying on poultry are so low as to be negligible. 94% of chickens in this country are factory farmed, so not only do they not see any sunlight or grass, they also don’t encounter foxes. Husbandry practices appear a far more likely cause of death in not only sheep, but also other livestock, so perhaps we should get those practices sorted out before blaming foxes for everything. And crop farmers should be thanking foxes, as due to their diet of rabbits, they save those businesses more than £7 million a year. Some complain of pheasants being targeted, but to be honest, if people are breeding pheasants in inhumane cages only for them to be released and shot by posh people with nothing better to do, then I’m glad the foxes at least get some benefit out of this bizarre practice. And so to the city and the suburbs. It seems if you feed foxes in the city you are seen as an enabler of chaos, an encourager of ‘invaders.’ Well, in fact, foxes have a pretty liberal approach to food. They’ll mostly eat berries, insects and maybe some mice and birds. 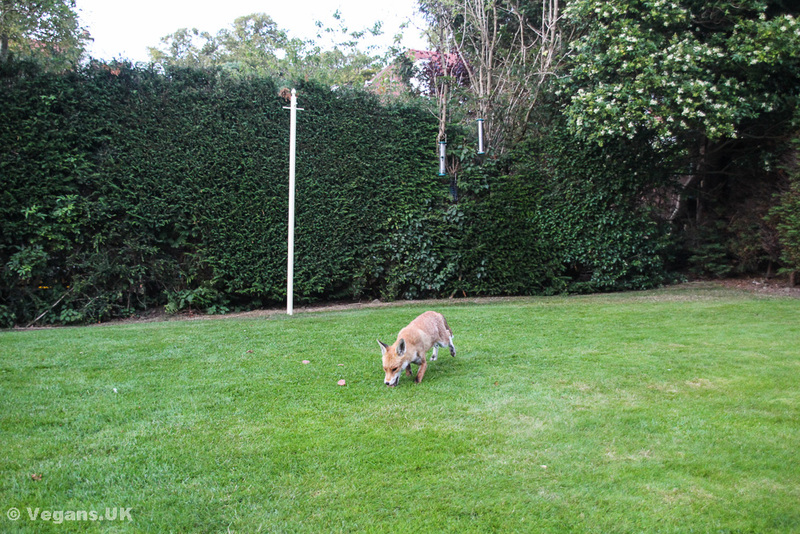 If you feed a fox, it’ll give you an opportunity to see them in your garden, which can be fascinating, but as with any wild animal, it’s unadvisable to invite them indoors. The only reason for this is that most people are not fond of having a fox nick food off the kitchen bench or poop on their couch. Let me make one thing perfectly clear, foxes are not in the business of attacking anyone. For one thing, it’s not in their interests to literally bite the hand that feeds them. Also, it’s a terrific waste of energy to say, bite a child, as has been reported in the media, and then run off with no food. Also, in several cases the fox who supposedly attacked a child hung around waiting to be chased away. This is at best questionable. Most of the ‘attacks’ reported by the media were found to be unlikely, given that the bites on the children were not consistent with fox bites, but with dog bites. In one case, the family involved were known to have gotten rid of their dog soon after the incident. Foxes being portrayed as a threat is bogus, as they are little bigger than your average pet cat. They are physically unable to upturn bins, although if another creature has done that they’ll be happy to scavenge from it. Foxes never just kill for fun. They carefully store any excess food they may come across for later – a practice that I feel humans could learn from. The government recently cancelled a vote on the ‘relaxing’ of fox hunting laws, as they figured out it was a vote they would lose. Fox hunting is nothing to do with fox control and everything to do with toffs getting their kicks from chasing after and then destroying a defenceless animal. Recently, an undercover investigation found that foxes were being bred in captivity to supply the hunt, which is screwed up to put it mildly. Have a look at this video by The League Against Cruel Sports and see for yourself.. The vast majority of the British public oppose hunting, but even if they didn’t, when the only defence offered up for a barbaric practice is ‘tradition’ the discussion should be over. Foxes deserve to be defended, not persecuted. Foxes rock.